Age of Kings Heaven » Forums » Mod Design and Discussion » Tales of Middle Earth - Version 0.8.13 Released! 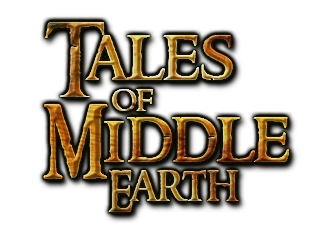 Topic Subject: Tales of Middle Earth - Version 0.8.13 Released! • Choose from one of 18 unique factions. - Guide the wise and fair elves - Lindon, Rivendell, Mirkwood, Eregion, and Lothlorien. - Fall under the sway of the Shadow with Angmar, Mordor, Isengard, Dol Guldur, or Minas Morgul. - Place your hope in the Men of the West with Arnor, Gondor, and fabled Numenor of old. - Ride with the Native Men of Rohan, Rhovanion, Harad, Umbar, or Rhun. 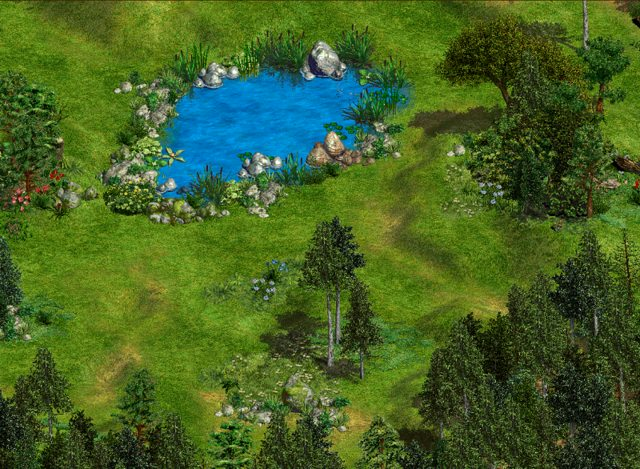 • Battle on new random maps based on real Middle Earth locations. • Research countless new technologies and decide the path of your race with faction choices. 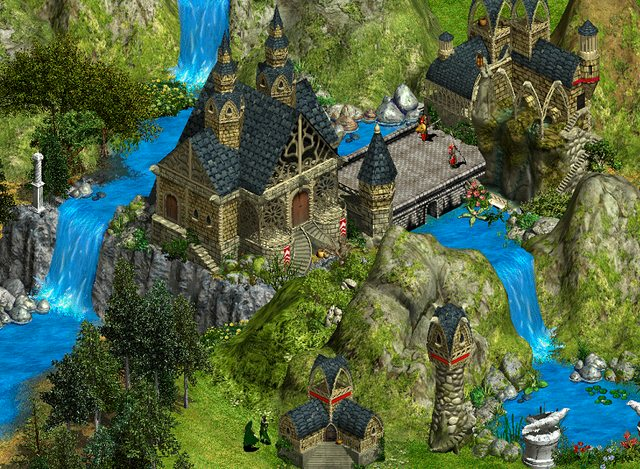 • Enjoy the rich world of Middle Earth as presented by one of the largest modifications ever produced for Age of Empires II. • Create that LOTR campaign you always had in mind or play online against a friend! Change Log - Find out what's changed in the latest version. The current version of Tales of Middle Earth is fully playable. Later versions will improve balance, eliminate bugs, and possibly implement some final features. If you would like to report a bug or suggest changes, please leave a comment below or add a bug report to the github page. NOTE: As Tales of Middle Earth is currently in a pre-release version, we ask that you bear with any discovered bugs or imbalanced stats for units or technologies. Please report any issues, and we will work hard on solutions. I'll probably expand on the topic with more previews and information, but for now at least we have a relevant thread. Also, if you haven't already, you can note my update on my current internet situation and the status of the mod in the last few posts of the previous thread. Oh ITS going to be sooo KEWLLL! Cant Wait! And good job on pulling through en entire conversion and not letting up on it - True Teamwork and goals! I am a redhead that loves to mod games. I love artwork, pixel art, creating or editing images of all kinds. Very nice. Now people shouldn't expect the concept art units. Numenor by far is the best and funnest civ. It is getting even better, with more touches and tweaks! Which side do you prefer for Numenor, in general, Elendili or King's Men? Oh I prefer King's Men, as getting 3 new units (that look awesome) I find more fun. I haven't really tried Elendil too much, as you get less units. However, it is good to have two political choices with positive and negative effects depending on which side you choose. AoCH (which I figured out how to work and I'm playing now) did the political decisions well. Most of time it was either Militia Infantry or Knights though. It's funny because; when testing this - the mod had many many problems and bugs. Now it looks and sounds amazing - I cant wait for it to be availible. Also a side note: I recently discovered a Rougelike RPG game called Tales of Middle Earth, though they renamed it to Tales of Mal-something so they wouldn't get shut down for copyright infringements. Me posting from the middle of nowhere. Apparently, it will happen from time to time. If I get a chance, any ideas for a Morthond Bowman? Release comming soon ? can't wait for this ! With little to do up here, I ended up devoting a good three hours to units last night. The result: more graphics! There's now a Dale Archer, Morthond Bowman, and Axeman of Lossenarch, all finished and uploaded to the dropbox. (The last one I did not make last night). More cool units for Gondor, haha! You don't have to use the Axeman, but I like him better and this gets rid of another AOK rippoff cut and paste unit. I kinda hate those. I'm driving home for the weekend (4-5 hours each way), so expect better internet access from me but less productivity. I still hope to finish both Mumak variations soon. Beyond that, there's the hill troll (which I'm not in any hurry to replace), and the wainrider chariot (which is a lot of work and something I sort of dread tackling). Neither of those will likely be done in time for the first release (the mumakil might be). Nothing else comes to mind. Oh! I remember one more! Shirrif of the Shire needs a new graphic! I hate the BoME/METC graphics for it... It looks too colourful and cartoony, especially with the ginger hair. All that should be left for after are the graphics for the Heroes for post-releases. No new previews. Got to keep some stuff for the release. I don't particularly like the hobbit either, but I'm not sure I can do all that much better. Shrinking 3d models down that small has so far yielded results for me with dwarves that I didn't love. Question about the Mumakils. There was some mention of implementing a switch between melee and ranged unit. Pulkit, do you plan to do this? If so I need to know so I keep the graphics identical. No switching between Mumak attack modes. Two separate units for melee and ranged attack. @Pulkit, I leave the decision in your hands. You can release the mod while I'm away and handle the new thread and such. Or you can push the release off until later this fall when I'll likely be back around with more unit graphics. Personally, I'm sure people have all waited long enough, so I'm happy to see this released while I'm away. I won't be very involved in multiplayer when it first comes out then obviously. I also had a Middle Earth Scenario contest planned where contestants would use this mod; that too is probably going to be on hold, though I'd still like for us to run it at some point. Any news on when the first release will be released ? Yes, yes, battlechaser. We won't wait needlessly to release the mod. We are working tirelessly to finish this! Matt, excellent new Gondorian units there! Love them! Feel free to re-prioritize these as per your graphic design moods and fancies! I suppose I could make an ax unit for the dawrflord, and the spear unit could then be the guardian. Sound good? It looks like I've lost the Nazgul models, which is easier to do than it sounds. I have 4-5 models for every unit, so literally hundreds of files. Once and a while one gets overwritten by mistake. I think I lost one or two Nazgul models, which means improving the unit is sort of too much work to bother right now. Besides, PC for Nazgul isn't such a big deal. For it to matter, you would need to be playing a Minas Morgul vs Minas Morgul match with both players in the third age or higher, both training a very expensive unit at the same time. Contrasting that with the artistic preference of having an only black rider, and this seems not really worth much effort. Jorgito's troll? I thought it had PC? Oh well, I guess I can look at it again. Yeah, I forgot this one. Any ideas for how it could look instead? 2. Dwarflord (20-30% done, I have the dwarf model somewhat ready from the last one). I've been thinking about the gameplay style we want to promote, and comparing it with Age of Chivalry. That games prohibitive age costs and early access to powerful units resulted in a rush heavy gameplay that is almost always over in the first or second age. While this was Kor's design choice (fast games with action beginning sooner), I think we might be looking for an opposite style. 90% of the "cool" stuff in ToME is in the 3rd age and Great years. The nations get more unique then, the alliances come into play, and there's generally more variety and fun. I think the game would play a lot better with cheaper age advancements. Say, 300F, 500F 100G, 750F 500G, as the age advancement costs? Or something in that neighborhood. That would hopefully result in fast age up times and most games being decided in the last two ages, as opposed to AoC where they are decided in the first two, and AoK where they are largely decided in the middle two. I said that when I thought I would have no internet access, just to give Pulkit the go ahead to not wait for me. Now that I've got some access, I'd rather we finished all these little enhancements. I apologize for saying this would be out in mid August. We decided to make it even more awesome than it was, so it's taking a little longer. It will be out soon enough. Yep, you've convinced me on the Nazgul! Actually, chuck the Olog-Hai. I have an idea how to add player colour to the loincloth. I'll give it another shot. Brigand ideas I will post when I have some. I think the game would play a lot better with cheaper age advancements. I think that's a marvellous idea! I'm all for it. I think cheaper aging will make warfare in pre-4th age obsolete and most games will just jump right to imperial age warfare. If you don't have anything interesting in the previous ages that's okay. This is looking wonderful. I'm even more astonished that you guys have stuck the hard yards, despite a plethora of things getting in the way, and the mod's now nearing completion. Keep it up! I don't think the effect will be so drastic. I'm quite positive that a second age rush with orcs (especially orc archers) will be very effective for the evil civs. Knights are only really a viable option for Third Age (the Great Years sees most civs get better cavalry options), and many other units available in the third age will be effective. Other civs, like Gondor and Numenor, are very deadly Great Years civs, with loads of options and powerful units. A gondor player might try to age up as quickly as possible, while a Mordor player will be more likely to rush. I'm sure once you guys start playing this we will have loads of balancing to do, but for now I'm pretty sure cheaper age advancements is going to lead to more varied, unique play. But will it have some military units available in first age, or just an equivalent of the actual Militia? 1st Age, standard AoE Militia Unit. Standard Building set. 2nd Age, Militia Upgrade, Skirmisher, Archer, Spearman, (maybe Snaga and Orc Archer) Cavalry. 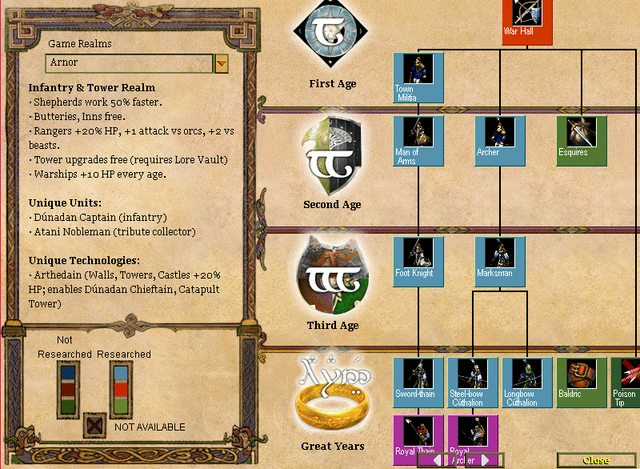 4th Age, Same New Building set, more units and unit upgrades more alliances. This is generally how units and upgrades go. Some Civs may have exceptions though. Actually, that's not exactly accurate. Outside of The Fall of Belariand (dark age), the civs use the newly designed buildings. Buildings do not 'upgrade', rather they change based on alliance. 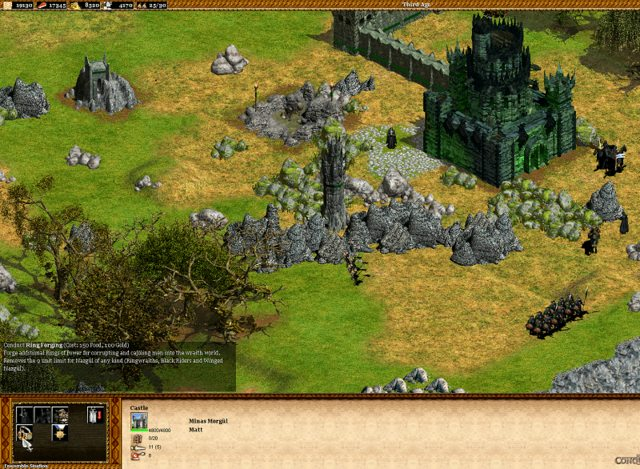 Orthanc buildings change whether you ally with Rohan or become a Vassal of Mordor. Similar situations apply to several civs. Correct. Age advancement is a misnomer in ToME. Civs have their own architecture styles. When you make alliance choices, you'll notice your decisions influencing the architecture of your buildings. Move Last Alliance to the 2nd age (currently in the last age). This means civs will get the Last Alliance units such as Gondor Captain early on. Move Dwarven Alliance (and similar techs) to 2nd age. Such civs will get Dwarven Guardians early on. New techs such as Numenorean Colony, Colonization, Silvan Union and Numenorean Stoneworks for economic benefits to eligible civs. Do you think this will disrupt the balance? Sounds like a very unique and cool system you've got planned. Looking forward to seeing it in the game! In age of empires good players do fast imperial in like 24 minutes(21-23 for Byzantines and Turks)? So in this mod they'll get to imperial at 15 to 24 minutes depending on how much cheaper the aging is. In chivalry the fastest archer rush is 8 minutes. If in this game you just need as much time to age and build the military buildings you need that only leaves a frame of 7 to 16 minutes for rushing. In ideal circumstances that is. Not that I'm against cheaper aging but just giving something to discus:P.
Hmm, I'm tempted to think this would be overpowered, but those no gold orc archers for evil civs look really deadly atm, so this might balance them out and give the other civs a counter in the Second Age. And I mean, from a books standpoint, Last Alliance works better moved to second age. 50 dollars is too less for 4 years of modding. If in this game you just need as much time to age and build the military buildings you need that only leaves a frame of 7 to 16 minutes for rushing. Interesting. I do not intend to drastically lower the age costs. Minor reductions will allow a larger time span for rushing, while enticing players to age up. Additionally, palisades are made somewhat stronger to block early rushes: the Fosse research and the Out-wall upgrade (new in v0.5). I've managed to come up with something for everyone (other than Rhun and Dol Guldur), ranging from offensive alliances to defensive upgrades. This might help keep everyone on fair ground.